Microbial fuel cells may well be the next black (or at least brown) gold. But to tap those anaerobic reserves, we'll need a power station that can run on carbon-rich gas. Something like the DFC-3000 fuel cell—it turns biogas into power 2200 for homes and their hydrogen cars. Welsh Physicist William Grove patented the first fuel cells back in 1839. A fuel cell is composed of an electrolyte sandwiched between a fuel source (something to produce hydrogen) and an oxidant. The cell oxidizes the fuel at the anode and draws electrons to the cathode via an external circuit. When the electrons reach the cathode, they recombine with the hydrogen and push ions across the electrolyte and complete the circuit while producing carbon dioxide, water, and a few other trace chemicals. Since these cells are self-contained generators with few moving parts capable of operating without combustion, they are ideally suited for remote areas that are otherwise inaccessible to main power grids or for on-site power for large institutions like hospitals, universities, and utilities. NASA has even employed fuel cells in numerous probes and satellites. 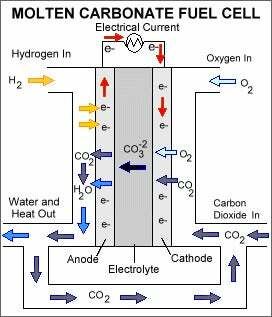 Molten Carbonate Fuel Cells (MCFC) are a hardy variation of the technology. MCFCs were patented by William W. Jacques in 1897 and were developed further by Lawrence Livermore Labs. The heat a lithium potassium carbonate salt until it melts. In the molten state, the carbonate salt conducts electrons so it is suspended in a porous, ceramic matrix and employed as the cell's electrolyte. The MCFC needs to achieve temperatures in excess of 650 degrees C (1000 degrees F) in order to melt the carbonate salt. This makes MCFCs less than ideal for mobile power generation—it takes too long for the cells to heat up—but does impart a few benefits. First, the extremely high operating temperature means that the machines can use electrodes made of non-precious metals, making them cheaper to produce. Second, these cells are able to extract hydrogen directly from the fuel source, a process known as internal reforming. This is something lower temperature cells cannot accomplish, which also reduces cost. Third, they're not prone to electrode poisoning, aka "carbon choking," wherein carbon and other impurities build up on the electrodes like plaque, reducing their efficiency. This increases the variety of fuels MCFCs can use, including natural gas, bio-gas, even coal gas and other carbon-heavy sources. Finally, the MCFCs are more efficient than other fuel cell technologies and many fossil fuels. 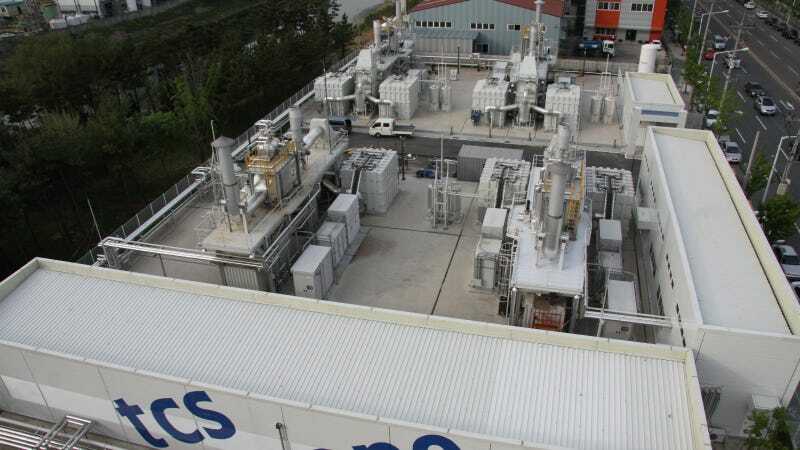 MCFCs achieve an electrical efficiency of up to 60 percent—compared to 37-42 percent efficiency of conventional phosphoric acid fuel cell plants. And when combined with cogeneration technology, capturing and reusing the MCFC's waste heat, electrical efficiency can approach 90 percent. The MCFC's main disadvantage is its durability. Due to the high operating temperature and corrosive materials employed, MCFCs tend to break down faster than other fuel cell technologies. Their other fault is that the process of internal reforming also produces greenhouse gas CO2 as a by-product, though it often isn't much. FuelCell Energy's DFC-3000 is a type of MCFC, known as a Direct Fuel Cell (DFC). This 126 ton device is 71 feet long, 41 feet wide and produces 2.8MW at 47 percent efficiency—enough power to illuminate more than 2200 homes. The DFC-3000 can also be daisy-chained to scale its power production to up to 50MW. The interior of an single fuel cell stack may be filled with as many as 400 individual cells. It consumes 360scf of natural gas every minute and expels 980 lb of CO2 per MWh. Compared to other forms of power generation, that's fantastic—coal plants generate 2249 lbs/MWh on average, oil produces 1672 lbs/MWh, and natural gas produces about 1135 lbs/MWh. And with cogeneration, it only expels about 600 lbs/MWh, half of the next cleanest fuel source. As its technology continues to mature, the roles for MCFC are expanding. FuelCell Energy, for example, operates a power plant at a Orange County Sanitation District wastewater treatment facility to not only provide power to treatment plant but also as a source of fuel for a fleet of Air Products hydrogen cars.